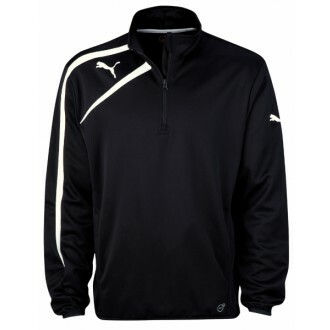 Made by Puma, the Spirit 1/2 Zip Training Jacket is ideally suited to life both on and off the training ground all year round. As is befitting of a quality brand such as Puma, from the moment you pull on and zip up this training jacket, you can feel the quality and comfort running across your body and arms. Made from 100% polyester, the soft feel to the garment includes Puma's Dry Cell Moisture Management which draws sweat away from your skin to leave you feeling dry and comfortable. The ½ zip allows the top to be easily sported over other clothing whilst the elasticated cuffs and waistband create a snug fit and help keep the warmth in. Two open pockets along the sides add a final practical touch to look after any small items or simply place your hands. 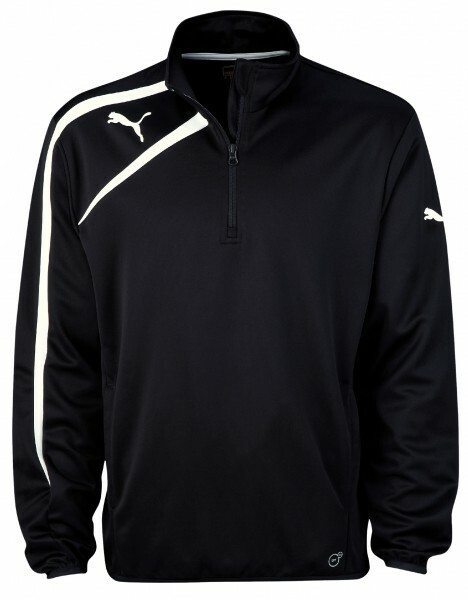 A stylish plain black offering is complemented by white strikes leading off the right side of the collar, between which the distinct Puma logo is printed. Whether worn on the terraces or simply as casual attire along the high street, this Puma training jacket is a practical and stylish offering.